The Four Arch Canyon trail is located just off of the Gemini Bridges Road near Moab, Utah. A 4x4 jeep road leads into the canyon and provides the trail for this hike. The further into the canyon the rougher the road becomes. As the name implies there are four arches within the canyon namely Bullwhip Arch, Shadow Arch, Mosquito Arch and Crips Arch. The geology of the canyon differs from some of its neighbors whereas rather than sheer towering cliffs of Wingate sandstone the upper portion of the canyon walls are composed mainly of rock fins that are situated perpendicular to the inner canyon making it difficult to see through the openings of the arches. It is hard to pick a good trailhead picture for a hike that doesn't have any official trailhead. The easiest way to get to Four Arch Canyon is to follow Highway 313 for 13 miles and turn left onto the Gemini Bridges Road. Follow the dirt road for 4.7 miles and turn right on the Four Arch Canyon Road. The turnoff is marked with a sign. The upper section of the Gemini Bridges Road is suitable for passenger cars. The Four Arch Canyon Road is a little rougher though. We had to park about a half mile before the Entrada Boy Scout High Adventure Base because of a particularly bad spot in the road. On the way in we passed a car that had also parked along the road. If you park at the turnoff from the Gemini Bridges Road add 2 extra miles to the round trip distance or hike only as far as the last arch and it will come out about the same anyway. When driving in on or hiking on the Four Arch Canyon Road you will come to a fork in the bottom of a wash. Stay to the right. The left fork leads into another short branch of the canyon. 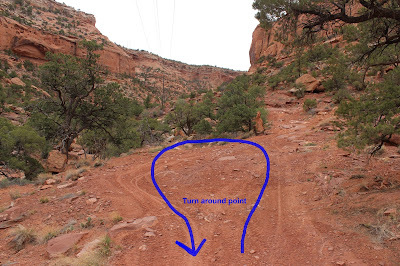 Continue on the main road staying to the left at the next fork and go on past the Entrada scout camp sign. Ignore their sign that says to check in at the office unless of course you are a Boy Scout and they are expecting you. Follow the road around the big rounded rock and stay on the main road when you pass a ranch on the left. You should be heading into the canyon that has the power lines passing through it. The road will drop down into a wash and follow it for a short distance before climbing out the other side. It is at this point that the arches begin although they aren't quite visible yet. 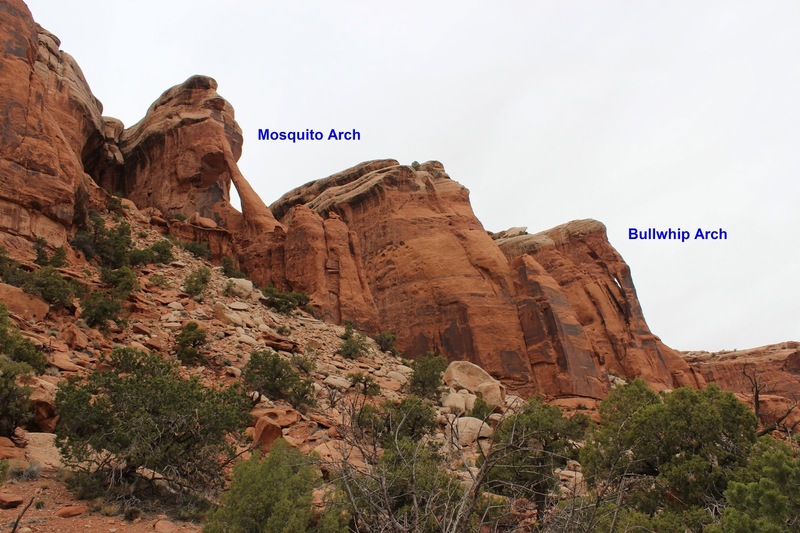 Bullwhip Arch and Mosquito Arch are both on the north side of the canyon. Bullwhip Arch is the first one that you come to. This picture was taken looking back toward the mouth of the canyon because both arches show up better in that direction. Bullwhip Arch hugs the side of the canyon wall is what we have always called a finger arch. Shadow Arch is located directly across the canyon from Bullwhip and Mosquito arches. Aptly named Shadow Arch is best viewed on a sunny day when its shadow can be seen on the surrounding cliffs. The arch is nestled far enough back in the wall of the canyon that a person can't see through the opening even after climbing up the side of the mountain. Continue hiking another quarter mile or so into the canyon for the last arch. Crips Arch is also located on the south side of the canyon up near the rim. The arch is in a rock fin that is sandwiched between two other fins. When looking through the arches opening about all you can see is the surface of the neighboring fin. Crips Arch is approximately 1 mile into the canyon from the Entrada scout camp. It is the last of the arches in Four Arch Canyon. The jeep road continues over another mile into the canyon. We turned around at the point where the road gets considerably rougher not too far from the head of the canyon. We were following some fresh animal tracks and wanted to see where they led. Four Arch Canyon is a good hike to add on to a visit to the Gemini Bridges which are only a short distance away. Trying to pick out all four of the arches can be a little like a treasure hunt. Hopefully the information contained in this post will help keep you from getting too frustrated with the search. If you begin at the Entrada camp and hike just to Crips Arch and back the round trip distance will only be about 2 miles. If you would like to see it for yourself then all you have to do is 'Take a hike'.